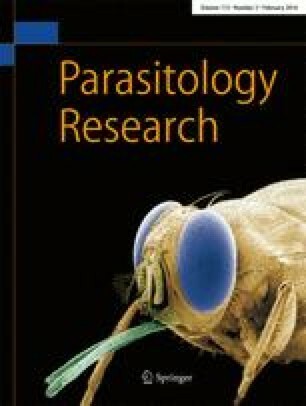 The objective of the study was to evaluate the in vitro efficacy of different concentrations of chloroform extract obtained from the aerial parts of Artemisia absinthium in comparison to amitraz on adults, eggs and larvae of the dog tick Rhipicephalus sanguineus using the adult immersion test (AIT), egg hatchability test (EHT) and larval packet test (LPT), respectively. Five concentrations of the extract (1.25, 2.5, 5, 10 and 20 %) with three replications for each concentration were used in all the bioassays. A control group was established (water + dimethylsulphoxide) together with a positive control group (amitraz), with three repetitions each. In AIT, the mortality rates were 0.0, 13.3, 16.7, 33.3 and 93.3 % in concentrations of 1.25, 2.5, 5, 10 and 20 %, respectively, and the variation was significant (p = 0.0151). The LC50 (CI) and LC95 (CI) values were calculated as 8.793 % (8.217–9.408) and 34.59 % (29.71–40.26), respectively. The egg production was reduced by 6.6, 6.6, 18.3, 42.5 and 85.1 % in the concentrations of 1.25, 2.5, 5, 10 and 20 %, respectively, and it was statistically significant (p = 0.0274). In EHT, hatching was completely inhibited at 5, 10 and 20 % displaying 100 % ovicidal action while at the concentrations of 1.25 and 2.5 %, the inhibition rates were 20 and 60 %, respectively. In LPT, the extract caused 100 % mortality of larvae in the concentrations of 5, 10 and 20 % after 24 h while at the concentrations of 1.25 and 2.5 %, the mortality rates were 54.3 and 96.7 %, respectively. The LC50 (CI) and LC95 (CI) values were determined to be 1.11 % (1.099–1.121) and 2.37 % (2.328–2.423), respectively. The results show that the extract of A. absinthium has acaricidal properties and could be useful in controlling R. sanguineus which is an efficient vector of pathogens both in dogs and humans.